Art Libraries Journal issue on zine libraries in the U.K.
“Each according to their ability : Zine librarians talking about their community,” written by Jude Vachon, Kelly Wooten, Kelly McElroy, and Violet Fox, was published as a chapter in The Politics of Theory and the Practice of Critical Librarianship, edited by Karen P. Nicholson and Maura Seale (Library Juice Press, 2018). The chapter is a reflective, informal discussion between the four long-time zine librarians, sharing how theory and practice work together in zine librarianship in ways informed by the human connections and sense of responsibility we feel towards our resources and each other. Topics discussed include the Zine Librarians Code of Ethics, zine cataloging, and feminist pedagogy. The latest episode of library podcast Circulating Ideas is an interview with Matthew Murray, Visiting Library Fellow at the University of Nevada Las Vegas and one of the long-time organizers of the Zine Pavilion. The first fifteen minutes of the episode are dedicated to discussing zines and zines in libraries. He also shares info about his own zine, Two-Fisted Library Stories! In the rest of the episode Matthew talks about his other pop-culture-inspired interests, including maker projects, comics, and podcasts, as well as the podcast he co-hosts, Book Club for Masochists. Take some time to learn about all the cool stuff that Matthew makes happen! The fourth episode of Read and Distribute, the zine-related podcast run by Canada’s Broken Pencil magazine, featured Marta Chudolinska, Learning Zone Librarian at the Ontario College of Art and Design University. Listen to hear more about Marta’s work in maintaining the OCAD zine library, along with members of the student organization OCAD U Zine Collective. The zine library recently celebrated their tenth anniversary! Our fellow zine librarians across the pond, UK and Ireland Zine Librarians (website, Facebook, Twitter), have a great guest post up from one of the founders of the newly formed Edinburgh Zine Library. Lindsay talks about reaching out to the public library in Edinburgh to start a collection and some of the challenges their collective encountered along the way. 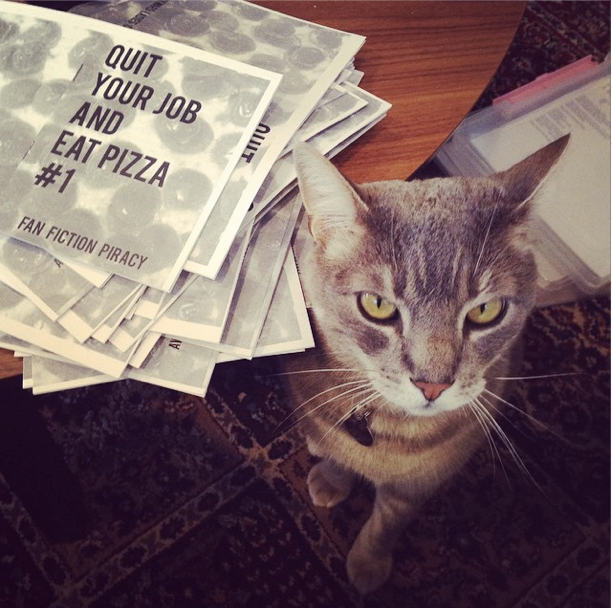 It’s well worth a read for those who are starting (or growing) zine collections of their own! Check it out at https://uizl.wordpress.com/2017/10/30/edinburgh-zine-library-opening/. Perhaps you’re aware that July is International Zine Month, but did you know that July 21st of every year is International Zine Library Day?? It’s true! A day just to celebrate zine libraries of all shapes and sizes as well as those who keep them running. You can find a brief FAQ and some simple celebratory images on this very site. A long-standing tradition has been to bring your favorite zine librarian a treat: vegan donuts are a particular favorite, but treats of any kind are welcome. If you’re a zine librarian—treat yourself!! Be sure to share your celebrations with the hashtag #IZM2017. Thanks to Stolen Sharpie Revolution for making IZM a time to share the zine love. Ideas to celebrate International Zine Month courtesy Stolen Sharpie Revolution—click to embiggen! We haven’t frequently highlighted scholarship about zine librarianship on this site, but when I read Ann Matsushima Chiu‘s chapter on “Engaging the Future of Zine Librarianship” in Librarians with Spines (Los Angeles : HINCHAS Press, 2017), I wanted to recommend it to other zine librarians. Chiu writes from her own experience as well as interviews with two experienced zine librarians, Cathy Camper (Multnomah County Public Library) and Jenna Freedman (Barnard College). The chapter moves beyond discussing how to establish zine collections within libraries, and focuses on the need for creating sustainable collections. Topics include the importance of institutional buy-in from the library as a whole, strategic and effective succession planning, and building communities through zine networks (including shout outs to the Zine Librarian email list, the Zine Pavilion, and the Zine Librarian unConference!). I’d highly recommend this chapter as a prompt for thinking about establishing zine collections which are not just one librarian’s pet project, but instead are seen as integral parts of building more holistic library collections. Ordering information for the Librarians with Spines book: from the publisher. Library info: WorldCat record. Inspired by Alana and Noah’s “Icebreakers are Awkward” zine, Jamie Glass created a zine for library student worker training—it’s a one-pager and a quick ‘n’ easy way to get to know people! Use and adapt as desired. This year two of our regular ZLUC participants won’t be able to make it to the conference in Austin because their former employers are at least a little bit douchey. Let’s see if we can help ’em out! Paypal your donation to jennafree@bigfoot.com, Venmo it to leslzine, or mail a check to Jenna Freedman | 203 Rivington St. #3C | NYC, NY 10002. The other one lost her job (after ten years pre- and post-MLS) when her position was deemed nonessential–“But can you help us with department planning before you go?” Like the other out-of-work librarian, she’d been a creative and proactive employee, founding the zine library, for example. Photo by Matthew at the Iowa City Zine Librarians unConference. Read the ICZLuC session notes linked from the schedule grids.